M50 Honda is home to Honda, KTM, and Stihl products in South Dublin. 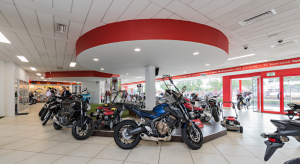 The showroom boasts the full range of Honda Motorbikes, ATV’s, Marine, Power Equipment and Lawn & Garden on display. Our expert staff are always on hand to help customers with product enquires and give advice on what would product would best suit their needs. The modern, expansive showroom makes it easy to explore the various brands at your leisure. Based in Ballymount, the showroom is easily accessible from exit 10 Northbound on the M50. Experience the Difference. Value Without Compromise. Our dedicated after sales team are purely focused on the Honda brand and the KTM brand to provide you with the best possible service and experience when you visit our service centre. We can service and repair all Honda Motorcycles, ATV’s, Marine, Lawn & garden, power products and KTM motorcycles. Our dedicated workshop technicians are factory trained to ensure that all service and repairs to your Honda and KTM are carried out to the highest standards this is our promise. Our service centre is open five days a week offering the best service and care available. You can call us on 01 4381999 or email hello@m50honda.ie.